Investors and traders are constantly fielding bits of data in hopes of piecing it all together to construct an annual game plan. However, there are few fundamental news stories driving prices early in the year that are still relevant in the latter months of the year. In fact, there is a good argument against basing a 2019 game plan on the current mix of price driving stories. For instance, the trade skirmish will likely have reached a conclusion, the Federal Reserve will probably stabilize its monetary policy, and the global economic and political landscape will expectedly be vastly different. Thus, speculating in the financial markets requires at least some speculation regarding these current talking points. In our view, a more helpful method might be to focus on the currency market, which is the ultimate driver of the commodity markets and, to a more delayed extend, the equity markets. 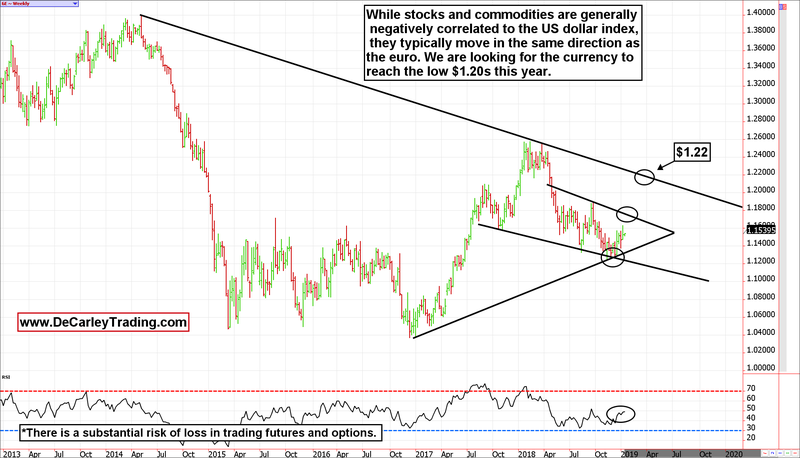 Most people are aware of the relationship between the US dollar and commodities, and even stock market valuation, but few give it as much credence as it deserves. This is particularly true in the commodity space in which a decrease in the value of the US dollar can offer immediate and profound support of commodity prices. In a similar fashion, a weaker dollar often boosts the value of overseas operations for US corporations and eventually has a positive impact on stocks. 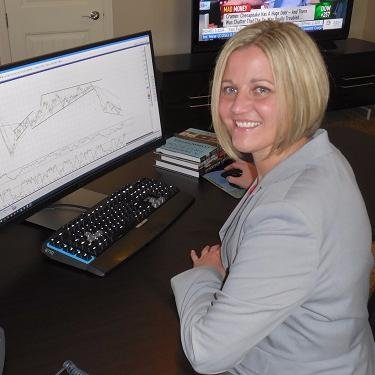 Nevertheless, it is a good idea to construct a well thought out analysis of the currency markets and use the conclusion to form opinions in commodities and financials. 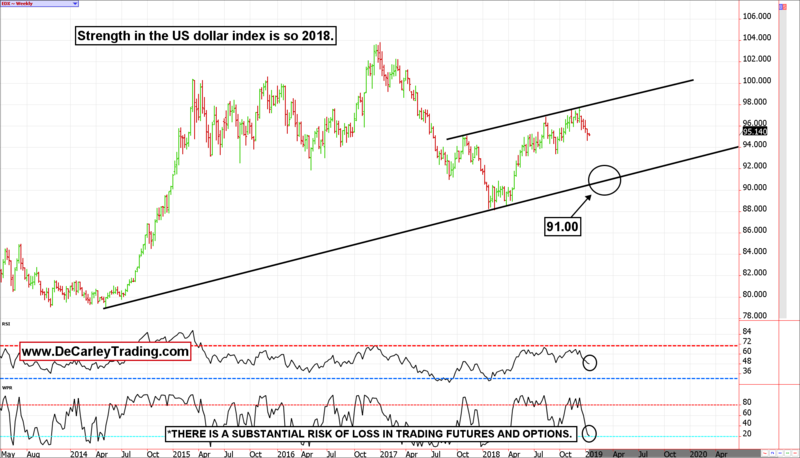 We aren’t saying all investments and speculations must be in-line with the anticipated direction of the dollar but it will undoubtedly be a large piece of the puzzle, so it is wise to keep it in mind. The dollar has benefited from the interest rate differential for much of 2018; while the differential will likely remain intact in 2019, it will likely narrow. Additionally, overseas political concerns such as the Brexit debacle and the Italian budget deficit have kept the euro under pressure (which has bolstered strength in the greenback). In short, we aren’t convinced the macro-economic factors that advanced the dollar in 2018 will persist in 2019. That said, we are more concerned about the chart of both the US dollar and the euro currency. In our view, they suggest the currency spectrum is due for a significant trend change. In our view, market fundamentals are priced into currencies in advance. Thus, utilizing technical analysis is a more helpful form of analysis. A quick look at the weekly chart of the US dollar index futures contract traded on the ICE (Intercontinental) exchange, reveals an inclining trading range that turned the rally around in the high 90.00s and suggests a pullback toward trendline support near 91.00. Because of relative strength in the US economy vs. other global superpowers as well as the maintenance of a healthy interest rate differential, we don’t see a break below 90.00 but a move to that area would be enough to boost the price of US exports; namely crude oil and soybeans, but nearly all commodities will benefit. For instance, a weaker dollar should extend the overall grind higher in gold and silver and at least provide some sort of support beneath the equity market. Now that we have an overall idea of how the dollar might behave in 2019, let’s attempt to confirm our conclusion using the euro currency chart. 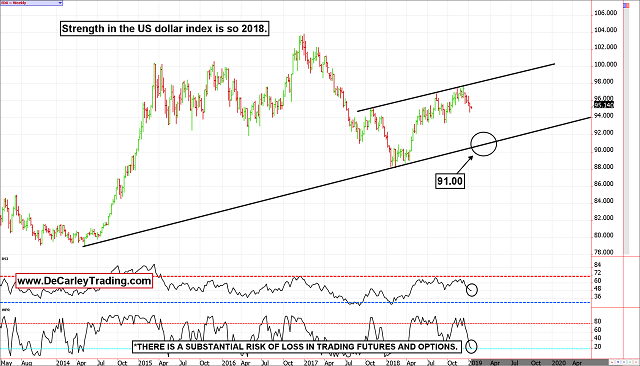 A successful test of support near $1.12 in late 2018 and an inclining RSI (Relative Strength Index) both suggest the path of least resistance for the euro should be higher in the coming months. Of course, Brexit headlines will create temporary noise but if the $1.12/$1.11 area holds, we suspect the euro will make a run into the low $1.20s. Like dollar weakness, strength in the euro will be supportive to commodities and, eventually, stocks. Naturally, the currency markets role on asset valuation isn’t the end all be all for investing. Nevertheless, it is a primary factor that shouldn’t be ignored. 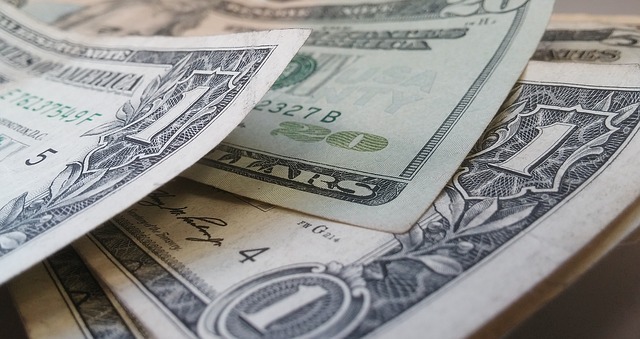 If historical norms guide the markets in 2019, a weaker dollar should offer a boost to the commodity markets and offer support to the equity markets. Play accordingly!